William Gilbert founded the scientific study of magnetism and is regarded, together with Galileo, as a founding father of experimental science. 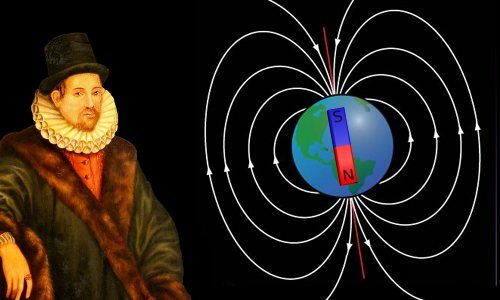 A forceful advocate of the power of the scientific experiment, Gilbert discovered that our planet has two magnetic poles; he defined these poles correctly and established that the earth behaves like a giant magnet. He correctly deduced that in everyday magnets, magnetism is caused by an organized form of the material the magnet is made of. Gilbert created the world’s first electroscope to detect electric charge and coined the Latin word electricitas, which soon became the English word electricity. Gilbert was a part-time scientist. By profession, he was an eminent doctor of medicine, eventually becoming President of London’s College of Physicians and personal physician to Queen Elizabeth and King James. He spent a large amount of his own wealth funding his scientific experiments. William Gilbert was born into a prosperous family in the town of Colchester, England on May 12, 1544. 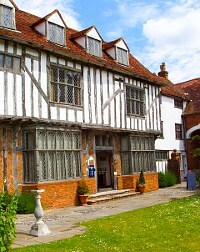 The house in which William Gilbert was born in 1544 still stands in Colchester. Photo by David Hawgood. His father was Jerome Gilberd, a lawyer and judge, one of the most important men in the town. The family name was spelt Gilberd or sometimes Gylberd. Gilbert is the modern spelling. William’s mother was Elizabeth Coggeshall. He was the first of four children. Sadly, William’s mother died when he was young. William’s father then married Jane Wingfield, and in the fullness of time, seven more children were born into the Gilbert family. In his early years, William was schooled at Colchester Royal Grammar School. 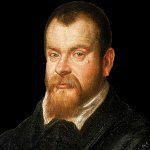 In 1558, almost on his fourteenth birthday, he began studying at the University of Cambridge, where after 11 years as a student and fellow of St. John’s College, he qualified as a physician. Details about Gilbert’s life are sketchy, because his personal papers were lost in the Great Fire of London in 1666. We know that at Cambridge he owned some of the works of Galen, Aristotle, and Dioscorides. So, remarkably, the knowledge he acquired was little different from that transmitted to medical students 1,500 years earlier in Greece or Rome. After spending a year as bursar of St. John’s College, Gilbert worked as a physician. In the early 1570s he probably traveled to Italy to practice for two years or so. Contrary to myth, he did not meet Galileo there: Galileo was under 10 years old at this time. In renaissance Italy, Gilbert would have encountered skepticism about Aristotle’s works, possibly for the first time, because his alma mater, Cambridge, was strongly Aristotelian. Aristotle’s incorrect view of how nature and the universe worked had dominated European thinking for almost two millennia. There could be no hope of scientific breakthroughs until his doctrines were dismantled. John Philoponus made a serious challenge to them in the sixth century. A year before Gilbert’s birth, Nicolaus Copernicus had issued a momentous challenge to both Aristotle’s physics and the Church, with his book The Revolutions of the Celestial Spheres. Copernicus proposed that all planets, including the earth, orbit the sun. He removed the earth from its Aristotelian place at the center of the universe. Such a challenge was not entirely original. In Ancient Greece, about a century after Aristotle lived, an astronomer by the name of Aristarchus proposed that the earth orbits the sun. However, his idea lay dormant for 1,800 years until Copernicus resurrected it. 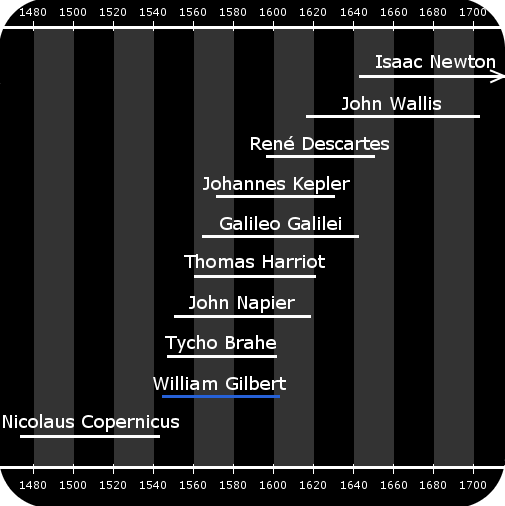 Gilbert’s lifetime and the lifetimes of related scientists and mathematicians. Gilbert began a medical practice in England’s capital, London. It was successful and he prospered. In 1581, age 37, he became Censor, a senior position in London’s College of Physicians. The College regulated the medical profession, issued and revoked practicing licenses, and punished medical malpractice. In 1600, the College elected Gilbert as its president. In 1601, he was appointed as one of Queen Elizabeth’s personal physicians. When she died in 1603, he continued for a short time as a personal physician to King James until his own death. 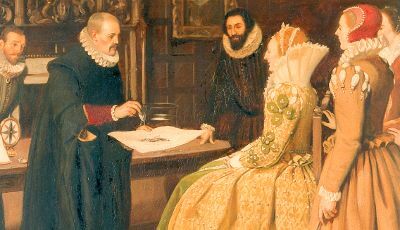 William Gilbert shows the effects of a magnet to Queen Elizabeth in 1598. Painting by Ernest Board. Gilbert was a wealthy man. This was partly because of his own efforts and partly because he inherited wealth when his father died. Unusually, Gilbert chose to utilize his wealth to pursue knowledge; he spent £5,000 on scientific experiments. This was a huge sum of money, enough to buy two large warships of the time: in 1590 the 400-crew, 690-ton, 39-gun warship Merhonour cost the Royal Navy £3,600, while the 223-ton, 21-gun warship Quittance cost £1,400. It seems appropriate to mention the Navy, because Gilbert’s interest in magnets was probably sparked by his naval contacts. Gilbert was an expert in tropical medicines, bringing him into contact with prominent Navy officers, such as Sir Francis Drake. For sailors, the magnetic compass was a vital tool. Like any good scientist today, Gilbert carried out a literature search to learn what he could about his research field. The greatest existing work on magnetism was Epistola de magnete, written in 1269 by Frenchman Petrus Peregrinus. Gilbert acknowledged his debt to Peregrinus when he wrote his own masterpiece De Magnete. In 1600, Gilbert published De Magnete. Its full English title is On the Magnet and Magnetic Bodies, and on the Great Magnet the Earth. According to Edward Wright, who worked with Gilbert, Gilbert waited 18 years before publishing his work. If this is correct, it suggests Gilbert carried out his experiments in the early 1580s. De Magnete and Galileo’s writings are commonly regarded as the first great works of experimental science. Gilbert’s experiments asked Nature questions and Nature gave him honest answers. His approach was brave. It was customary in the 1500s to regard experimentation as stepping on God’s toes; people believed man’s impudence in such matters could lead to divine retribution. Gilbert’s work was groundbreaking because people already thought they understood magnetic compasses. They used them for navigation; miners used them to search for veins of iron; and surveyors used them in tunnel construction. But Gilbert wanted to know more. He wanted to understand magnets at a deeper level, to understand the laws that govern their behavior. “…a magnet rubbed with garlic does not attract iron… errors like this have steadily been spread and accepted — just as evil and noxious plants ever have the most luxuriant growth. Gilbert’s intention is to replace the errors made by theorizing philosophers with healthy facts sourced from his own experiments. He disparages the work of Aristotle. He believes his experiments with magnets have refuted Aristotle’s four elements (which were actually devised by Empedocles) and scathingly dismisses the ideas of philosophers. An image from De Magnete showing compass needles pointing at a magnetic pole of a terrella. A lost book from the 1300s entitled Inventio Fortunata claimed compasses pointed to a magnetic island situated at the geographic North Pole. Alternatively, Petrus Peregrinus, the early authority on magnets cited by Gilbert, believed Earth’s magnetism was caused by the celestial poles in the heavens. Suspecting otherwise, Gilbert carried out an experiment. He constructed spheres about a foot (30 cm) in diameter. The spheres were made of lodestone, a naturally magnetic mineral. Today we call this mineral magnetite. It is an oxide of iron. Gilbert’s magnetite spheres were heavy, weighing in at about 165 lb (75 kg). He called these spheres terrellas (little Earths). When he held magnetic needles near a terrella’s surface, they behaved exactly like compass needles used by navigators. From this Gilbert concluded correctly that our planet behaves like a giant magnet. He defined the North Magnetic Pole as the place where a magnetic needle will point downwards vertically. We still use Gilbert’s definition today. Since his magnetite planet fully replicated Earth’s magnetic behavior, Gilbert deduced that our planet’s interior is magnetic. Electric and magnetic forces were commonly believed to have the same origin – they were thought to be occult forces. Gilbert’s experiments showed a clear difference between electricity and magnetism. He actually coined the Latin word electricitas, which in English became electricity. He concluded that the two behaviors were unrelated. Of course, we now know there is actually a deep connection between electricity and magnetism. However, to find it requires a flow of electric current, and no such thing existed in Gilbert’s time; his experiments were restricted to static electricity. It took more than 200 years before electromagnetism was discovered by Hans Christian Oersted utilizing Alessandro Volta’s recent invention of the battery to produce an electric current. To detect the presence of static electric charge, Gilbert made the world’s first electroscope, which he called a versorium. Gilbert’s electroscope was a small metal needle on a pivot. If you rub a cat’s fur, it loses electrons and the fur ends up positively charged. If you place an uncharged electroscope – here it’s Gilbert’s versorium – near the cat, some electrons in the metal electroscope will be attracted to the cat’s positive charge and gather as close as they can get to the cat fur. The mutual attraction of the positive and negative charges will turn the versorium to point at the cat – in this way, the versorium acts as an electric charge detector. Gilbert discovered that if an unmagnetized iron wire is heated until red hot, then cooled while pointing north, it will become magnetic. Today we call this effect thermoremanent magnetization. The effect was actually known in China in the eleventh century. It is an interesting effect, because ancient rocks cooling in Earth’s magnetic field became magnetized in this way, allowing geophysicists to deduce that Earth’s magnetic field flips between north and south every few hundred thousand years. If you’d been around 800,000 years ago a compass would have pointed towards Antarctica rather than the Arctic. Considering De Magnete today, we perceive it as a curious cocktail: we see exemplary experimental science, scientific observations, and scientific conclusions. There are also mistakes. And despite the frequent barbs Gilbert throws in the direction of “the rabble of philosophers” he also informs us of his own philosophical and even mystical ideas. For example, Gilbert tells us the planets have souls and that our own planet’s soul is magnetic. Today, of course, we would say such speculations have no place in science. Gilbert was not alone in mixing science with mysticism. The great Johannes Kepler also held surprisingly mystical views about the solar system, and, almost a century later, Isaac Newton spent more time on alchemy than on recognizable science. In Gilbert’s time, science was still trying to find its feet; Gilbert was actually one of the people who helped get it there, establishing it as our best mechanism of understanding the world around us. Gilbert never married and had no children. He seems to have been a busy man, working as a physician, carrying out a large number of experiments, and writing about natural philosophy. He also held meetings of intellectuals at his home, where he revealed his distaste for religious zealotry. He enjoyed a large income from rents on properties inherited from his father. During his own lifetime, he acquired more properties. William Gilbert died, age 59, on November 20, 1603. The cause of his death is not known for sure, but bubonic plague is probable: in 1603, thirty thousand Londoners died in an epidemic. He was buried in Colchester’s Holy Trinity Church close to the graves of his parents and the house he was born in. "William Gilbert." Famous Scientists. famousscientists.org. 2 Jun. 2017. Web. Astronomy and Geophysics, vol. 41, no. 3, pp. 3.16-3.19, June 2000. Painting by Ernest Board courtesy of Wellcome Trust under the Creative Commons Attribution 4.0 International license. Photo of William Gilbert’s home by David Hawgood under the Creative Commons Attribution-Share Alike 2.0 Generic license.